A ghostwriting career can bring you into contact with some interesting people. Like gangsters. We’ve actually had three come our way. Gangster #1 was the co-founder of a notorious Miami street gang — which was also a local hip hop crew that played venues with the likes of L’il Wayne and WuTang Clan. The gang split up for good when his partner was gunned down and he was afraid of following suit. When we interviewed him for the book, he would come to our place packing heat, until Lisa, not exactly the poster girl for the NRA, asked him to leave his gun in the car. He agreed, but, the next time he showed up, I had a feeling…and I asked him what he had on him. He sheepishly showed me a much smaller handgun sticking out of his pants pocket. We never got to finish that book because…well, we’re not sure why. Except maybe he thought a tell-all would be further injurious to his ongoing existence. Gangster #2 was involved in the notorious Whitey Bulger gang in South Boston. He had already had a bestselling book about his exploits (written by a different ghostwriter) and was looking to do some kind of follow-up. Specifically, he wanted to do a self-help book from the perspective of a guy who bashed a few heads in, sort of an “I’m OK – You’re Bleeding Heavily” thing. We never got to finish that one, because there’s a movie about him that might get made, which would up the price for a book sale substantially. Hopefully, we’ll get back into that one. Third time’s the charm. A little over a year ago, while we still lived in Miami, we met Gangster #3, Christian Valdes, a Cuban-American who managed several of the notorious South Florida “pill mills” a few years ago. We liked Christian and his wife Crystal immediately – and we thought his story was awesome. It ended up being a lot of fun writing it – and the best part was, we actually got to finish it. That’s Christian below. Don’t worry, the bullet holes are only tattoos. 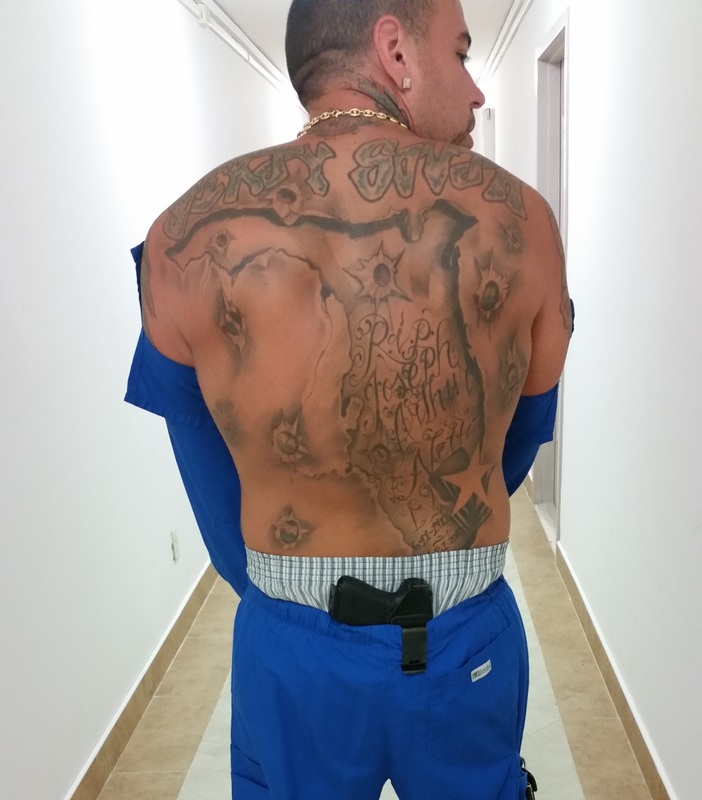 For 5 years, Christian Valdes was at the center of the biggest drug operation in America. It was an operation that became internationally notorious, insanely violent and nonstop freaky. It made its kingpins millions and millions of dollars, and it made Valdes as much money as he could possibly make in a day — because there were endless numbers of people lining up for what he had the power to give them. Those people were willing to do just about anything to get it. With the men, that generally meant money. With the women, that meant money – and almost any kind of sexual arrangement Valdes proposed. And the interesting part about this operation? It was completely legal. From 2000 to 2009, Florida’s incredibly lax prescription drug laws fueled a huge spike in so-called pain management clinics, especially in the Fort Lauderdale-Miami area. CNN and other national news media outlets tagged these clinics as “Pill Mills” — and with good reason. When Valdes managed them, they gave out heavy-hitter drugs like Xanax, Percocet, Oxycontin, Roxicodone and Methadone just like they were candy. And because the Sunshine State kept everybody in the dark about who was prescribing what, somebody could easily go into one clinic and get some Oxy and then head over to a different clinic for some more a few minutes later. Valdes helped a whole lot of people do just that – including a posse of strippers he sponsored – because he was running his own operation within the operation. Pill Mill is his no-holds-barred memoir of life in the center of the action as the whole pain clinic scam spiraled out of control. 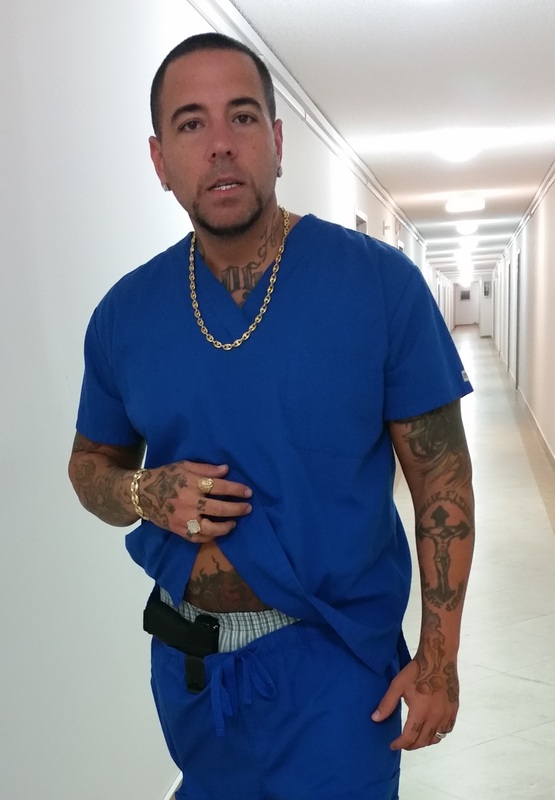 In this book, you’ll hear this full-blooded Cuban’s whole story – from the rough-and-tumble childhood and high school years that shaped him; to how he started dealing weed and eventually began growing it himself; to how he quickly learned how to work the pill mill scam and how he recruited friends and family to help him make the most money in the fastest amount possible; to how Hurricane Wilma almost put him behind bars for who knows how many years. Valdes also reveals the major players behind the pill mill scandals, talks about his frightening and sometimes hilarious conflicts with psychotic junkie patients and takes the reader inside one of the most notorious “Jungle Houses” of the time – a sad excuse for a clinic where junkies zoned out at a backyard barbeque, dozens of drug deals went down, and the owner, the infamous “Pill Mill” Vinny, sat behind a desk with over 200 grand in cash piled on top of it. For the first time, this book offers an insider’s look at what happened when Florida became ground zero for pain pill abuse. At one point, the country’s top 50 prescription pain pill sellers were ALL in Florida – and 33 of those 50 were in Broward County, where Valdes got involved in the racket. There were more than 150 storefront pain clinics in Broward at the height of the madness. This is a story that has yet to be told in movies, TV shows or even in another book. This is a story that could only happen in South Florida. Just like Christian Valdes is a guy you would only find in South Florida.